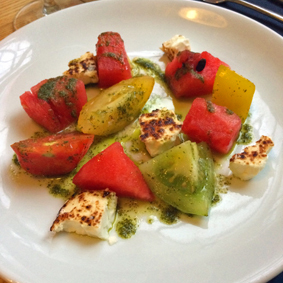 Trying to find somewhere for a leisurely meal in Brixton is more difficult now so we set off with guests for a second visit to Hood – a crowdsourced restaurant in Streatham that we really enjoyed the first time (see here). We were not disappointed – it was as friendly as the first time. We won’t spend time describing the décor as it hasn’t changed. But we were glad to see that even on a Wednesday night they were full, so definitely book ahead. This is somewhere for a special occasion or when you want a chance to have a conversation (although when full it is not quiet). Only a 20 minute walk from the middle of Brixton, or only a short bus ride if you have already done your 10,000 steps that day. 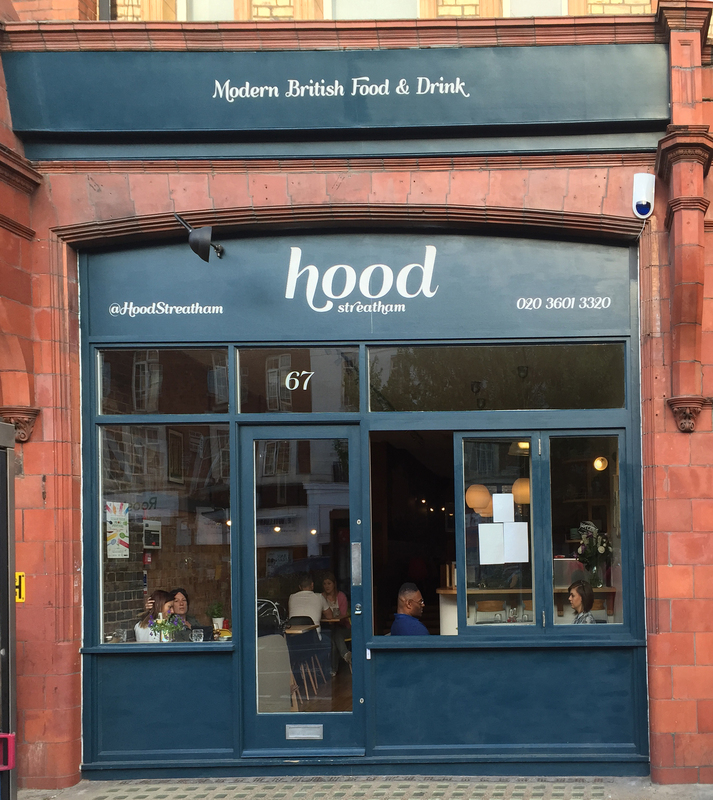 Hood serves modern British food from seasonal British ingredients. There is a provenance map for ingredients so you can count the food miles, and another wall with the names of everyone who took part in the crowd fund. They are open for brunch, lunch and dinner and we arrived just before 8.00pm. The short menu has 5 starters, 6 mains and three desserts as well as specials. We didn’t take a picture of the menu and it does differ from the one on the web with a bit more of an update on the seasonal ingredients. No cocktails on this occasion, although they did look tempting so we dived into the food accompanied by a bottle of Spanish red wine which also doesn’t appear on the website. It was a warm night, so three of us chose the cold tomato soup with crabmeat and guacamole and the remaining one a salad with charred feta. The tomato soup was a great success, tasty and imaginative, and the other a salad with toasted feta was a good foil for the slight sweetness of the dressing. We were a bit more varied on the main courses – with chicken, hake and lamb accompanied with seasonal greens and potatoes. 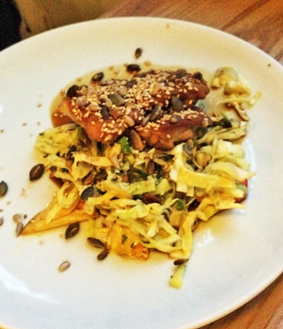 The chicken was crispy with a sesame covering but was soft inside. 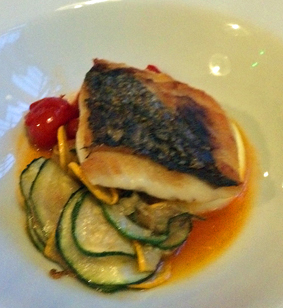 The hake was cooked perfectly and the vegetables were tasty – especially the potatoes. So now we are left with the lamb which was a bit tough. In fact mine was so tough it was removed from our bill. I suspect the cut should have been bashed a bit to break down the connective tissue or slow cooked. 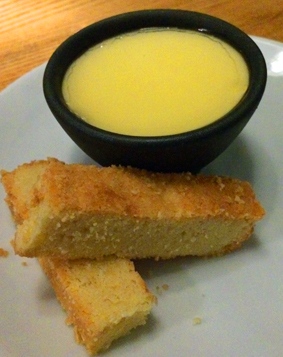 Our desserts were to share and we all chose lemon posset with shortbread biscuits. We polished both off in short order. The wine really opened up during the meal but we could have chosen local beers from Gypsy Hill or Brixton but they are pretty strong so beware. 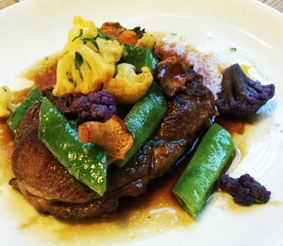 We really enjoyed this meal despite the problems with the lamb. Even with that dish removed the bill came to £130.50 for four so not somewhere for a quick or cheap meal out but certainly somewhere we will return again.